Anyone that has cats will know that as soon as the Christmas tree is up, the cats will be trying to climb it. While this may not cause any problems for the majority of the time, there is a chance that the tree could topple over and the cat could get injured. As professional pet sitters, we’ve seen some close calls. Fortunately, it is possible to make a cat-friendly tree, and you don’t have to have great DIY skills to put it together. The most important thing that you will need is a corner shelf unit that does not have a backboard. If the shelf is unpainted, then this is even better as you won’t have to worry about how the green paint that is applied will look over the top of another color. These units are vaguely tree-shaped, but the shelves provide the perfect place for cats to sit as they climb the tree. How you decorate the tree is up to you. Some people prefer to add green sisal material to the legs of the unit as this gives the cats something to scratch. If you can make presents out of material for the bottom shelf they will have somewhere to use as a bed. Lights can be used on the tree, but it is probably best to go for ones that are covered rather than string lights. 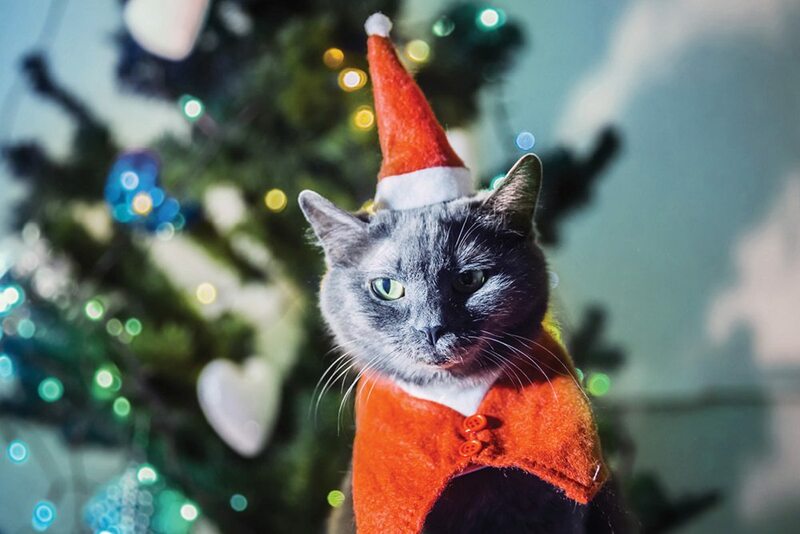 Cat toys are often available in festive colors such as green and red and if you can find ones with a Christmas theme these can be used in place of ornaments. The cat-friendly Christmas tree will still look festive and will make a great addition to any room. The most important aspect of it though is that it will be sturdy and it is designed for cats to climb on. This means that you can relax as you watch the cats enjoy the tree and you do not have to worry about them being in any danger.